Add the meats and boil with salt, pepper, 2 Knorr cubes and half of an onion. Boil the meats separately because of different cooking times. Cook all meats until tender and there is little to no water left in the pot. 30-50mins. Once the water is dry, add the crayfish, pepper and palm oil and stir into the meat. If using periwinkles, add them at this time and stir. Cook for 5 minutes. Add the waterleaves/efo, stir and cook for 3 minutes. 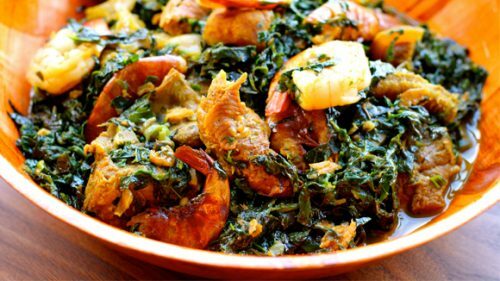 Add the pumpkin leaves (ugwu) and cook for 5 more minutes. Check for seasoning and add more salt if needed. Stir often so it does not get burned. Do not add water. The palm oil is the only liquid in this soup.